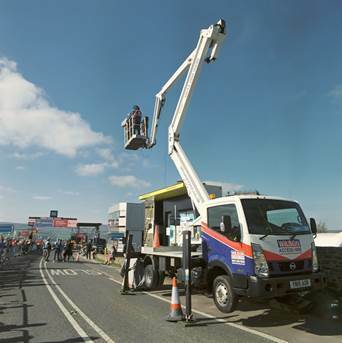 A Wilson Access Hire Truck Mounted platform enabled a TV production company to get close up views of competitors in all four stages of the 2018 Tour de Yorkshire cycling race. The 2018 Tour de Yorkshire was a four day cycling stage race in Yorkshire over 3–6 May 2018. Kutunak Productions hired the 20.7m articulated Truck Mount for the fourth year running over the four days of the race to film the cyclists crossing the finishing lines in Doncaster, Ilkley, Scarborough and Leeds. The 10 metre horizontal outreach and reach height of 20.70m of the CTE ZED 21JH Nissan Truck Mount was particularly important, as it allowed the cameraman to be positioned above the centre of the road to capture the cyclists as they crossed the finish lines. The weight capacity of the basket was also an important consideration when specifying the Truck Mount – its 300kg safe working load capacity is higher than other machines with similar reach heights and was sufficient to carry the cameraman and his equipment.